In order to perform this easy-to-use powerful angle you will need to have the daily racing form. This spot play can be applied to all types of thoroughbred horse races. This free horse racing system angle will give you both longshots and favorites. The basic premise of this free horse racing system is to give you your best top connections at your racetrack. Trainer and jockey combination(s), as you know, can and will make a difference when narrowing down a field of even-matched opponents. This can aide you in your final decision. This "edge" will give you a WIN bet, which will lead to the exacta win bet and hopefully lead to the trifecta win bet. Like any sport, a chemistry between a trainer and jockey evolves over time. A strategy is developed. A synergy is created over a period of time and hence a top combination / percentage is produced. J / T directly under the past perfomance of each horse in the race. This statistic will show you the current meet and current year. In order to correctly apply this free horse racing system the Jockey / Trainer statistic needs to have certain criteria in order to be applicable. The Jockey/Trainer combo must have at least 6 starts, with 15% wins and a profit of over $2.50. This statement shows: Jockey/Trainer combination for the years 2005-06 at Santa Anita racetrack. 6 combo starts, a 20% factor and $2.40 mean profit. An important system factor(s): The horse must have finished out of the money its prior race - 4th or worse. The horse must have raced within one month (30 days). Longer layoffs should not be applied. You may find an exception to the layoff rule by looking at the horses latest workouts. If the horse has not run in over 30 days but does show a bullet(s) workout it may be considered. Your handicapping knowledge will no doubt decipher this exception. 1.Locate the Jockey/Trainer combination statistic. 2.Must have at least 6 starts. 3.Must show 15% or higher percentage. 4.Must show a profit of $2.50 or higher. 5.The horse MUST finish 4th or worse in its last out. 6.Layoffs of 30+ days cannot be applied. The Jockey / Trainer statistic is used by many handicappers to assist in their final decision to pick the horse that they think will enter the winner's circle. Afterall, top percentage trainers always get a better "look" before the race as does top percentage jockeys. Now you have an actual combination percentage at a specific racetrack! This free horse racing system is very simple to apply. All you need to do is stick with the rules and apply them correctly. It's your discipline that can bring in profits from any winning method. For additional racing information for wagering on any angle visit the partwheeling strategies. To date, the Jockey/Trainer betting strategy has been averaging a payoff of approximately $11.00 per win in my experience. This does not necessarily mean it doesn't create longshot winners. If you are analyzing a maiden race with horses that have less than 3 races, cross check the J/T combo with the trainer's yearly statistic and the current meet percentages. This statistic shows the starts, wins, place and show at that meet for the current year. This will greatly help your handicapping analysis and it will enhance your knowledge using top percentage trainer/jockey combinations. As I continue to research and develop more angles, I will conveniently post them on this website for your viewing. Another Free System for your viewing pleasure. 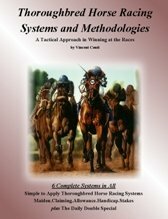 "Thoroughbred Horse Racing Systems and Methodologies"
Also included is a top win percentage system titled "The Daily Double Special - The Hidden Money." Six Systems for $24.95 ...only 4 bucks a system! Want to Download a copy of my book? Guaranteed to be faster and cheaper!